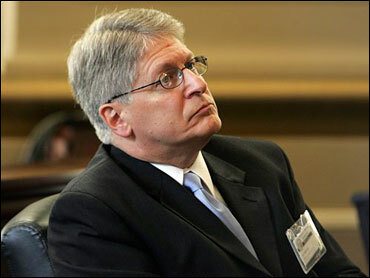 Disgraced former prosecutor Mike Nifong acknowledged Thursday there is "no credible evidence" that three Duke lacrosse players committed any of the crimes he accused them of more than a year ago, offering for the first time a complete and unqualified apology. "We all need to heal," Nifong said. "It is my hope we can start this process today." Nifong's apology came as a judge began considering whether to hold the former Durham County district attorney in criminal contempt of court for his handling of the case. Superior Court Judge W. Osmond Smith III has already concluded there is probable cause to believe Nifong "willfully and intentionally made false statements of material fact" to the court during a hearing in the case last fall. If he finds Nifong in contempt, the now-disbarred former prosecutor could face up to 30 days in jail. The case started with a woman's allegations that she was raped at a March 2006 lacrosse team party where she was hired as a stripper. Nifong won indictments against three team members, but the charges were later dropped and state Attorney General Roy Cooper went a step farther by declaring the three men innocent victims of Nifong's "tragic rush to accuse." "I agree with state Attorney General there is no credible evidence that (the players) ... committed any of the crimes of which they were indicted," he said. Attorneys for the three falsely accused players, who had previously rejected Nifong's attempts to make amends, accepted his apology. "For many months, we have sought a real and meaningful apology from Mr. Nifong, for the pain he has caused these families and these young men, the entire Duke lacrosse team, the state of North Carolina and others," said attorney Joseph Cheshire. "We are very appreciative that Mr. Nifong decided to do that today," he said. "We don't deny it was a difficult thing." Nifong learned in April 2006 the laboratory found genetic material from multiple males on and about the accuser, but none from the lacrosse players. He didn't provide that information to the defense until October, and only then in the form of nearly 2,000 pages of raw DNA test data. A disciplinary hearing committee of the state bar stripped Nifong of his law license last month after finding he had committed more than two dozen violations of the state's rules of professional conduct during the case. The last 16 months have proven to be a difficult and painful journey for my family and for myself. I know this has also been a difficult and painful journey for Reade Seligmann, Collin Finnerty and David Evans, for their families, for Durham and for the state of North Carolina. We all need to heal. I believe, however, that this healing process cannot truly begin until all proceedings involving this matter are concluded and everyone is able to go forward. I have resigned my position as Durham's district attorney as a part of this process. I have read the report released by the attorney general, including his recitation of evidence I did not have, evidence that he obtained from his own investigation. I agree with the attorney general's statement that there is no credible evidence that Mr. Seligmann, Mr. Finnerty or Mr. Evans committed any of the crimes for which they were indicted — or any other crimes against (the accuser) — during the party that occurred on March 13th and 14th, 2006, at North Buchanan Boulevard in Durham. Mr. Seligmann, Mr. Finnerty and Mr. Evans were entitled to the presumption of innocence when they were under indictment. Surely they are entitled to more than that now as they go forward for the rest of their lives, and that is what the attorney general tried to give them in his declaration that they are innocent. I have admitted on more than one occasion that I have made mistakes in the prosecution of these cases. For that, I sincerely apologize to Mr. Seligmann, Mr. Finnerty, Mr. Evans and to their families. It is my hope that all of us can learn from the mistakes in this case, that all of us can begin to move forward. It is my hope that we can start this process today.